Recap of the Last 5 Games (Games 36-40) · Let's Go Amerks! Welcome to the eighth part of a 15 part season series highlighting the last five games (the last segment will be six games) showing off the stats, standings, highlights, transactions and whatever else took place prior to the next five games. The goal is to post these the day of the next game of a five game set. A little different than a weekly format to give us a better snapshot of trends as the season goes. The team finished the last five games with a record of 2-2-0-1. They’re still in first place based on points and winning percentage. The team had two big wins against (Toronto and Wilkes-Barre/Scranton), two close losses (Laval and Lehigh Valley), and a blow out loss against Toronto on home ice. A shortened Amerks schedule allowed for three Amerks Weekly episodes to be recorded in case you missed them. Even though it’s been 21 games since Lawrence Pilut has played with the Amerks he finally fell out of the top five in scoring. Or should I say, others finally caught up? Danny O’Regan moves into the top five spot along with Wayne Simpson. They bumped Nylander and Pilut to 6th and 7th. Looking at just league leaders on defense, Zach Redmond moved into the top spot ahead of TJ Brennan. 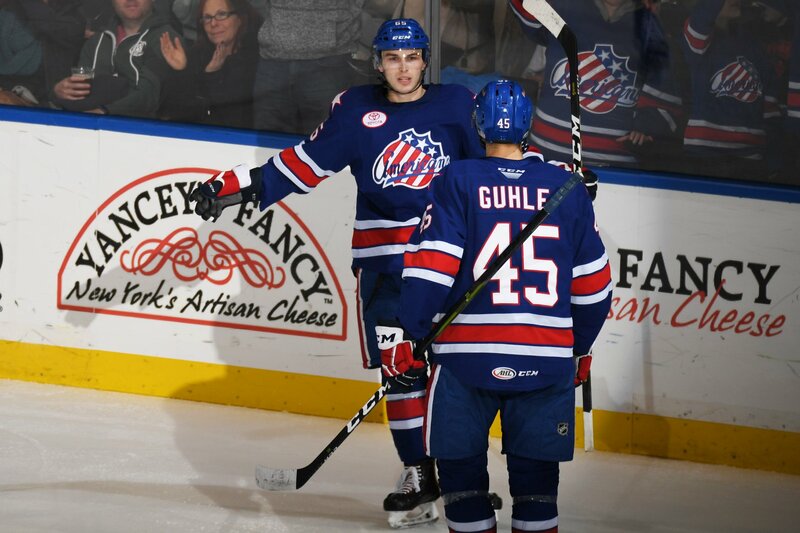 Redmond has tied the Amerks franchise record for goals by a defenseman, one more to break it. The second half of the season is going to be all about points. Points in the standings and points on the score sheet. That’s the only way to remain in first place and at the top of the league. Scott Wilson has started to settle into his role on the team and tallied two assists in his first four games. Newly acquired Taylor Leier has played one game but will be looking to find his spot on the team and work his way up the lineup. The names that are supposed to be leading are – Zach Redmond, CJ Smith, Victor Olofsson, Wayne Simpson, and Danny O’Regan. Now it’s time for Alex Nylander, Rasmus Asplund, and Kyle Criscuolo to find their grooves and start tallying more points. Internal competition has been talked about again now that there’s two extra forwards skating in practices with a soon to be third when Sean Malone returns from an injury. This is the time of the season when we find out who’s going to step up. It doesn’t get any easier once the playoffs start and this team learned last year that struggling in the second half hurt the teams chances. Defensively the team continues to be lead by Zach Redmond, Andrew MacWilliam, and Will Borgen. Brendan Guhle has had slight improvement as the season has gone on but we’ll quickly be at playoff time where he didn’t have the best performance last season. There’s only 36 regular season games remaining with Matt Tennyson in the organization. Jack Dougherty and Brandon Hickey have continued to go back and forth with the sixth spot on defense with each of them showing decent development curves. It’s pretty simple, score more than the other team and win. The good news is that the Amerks are scoring goals in first periods and are preventing the other team from scoring. The bad news is that it doesn’t equal wins. A season high 51 shots in game 40 wasn’t enough against a hot goalie in Alex Lyon. They’re getting the shots on net just not getting those second and third chances. The power play has remained consistent to keep them at 6th in the league with slight improvement in the penalty kill. Going 0/7 on the power play in the last game didn’t help the chances of winning but they were also up against the Phantoms who have the leagues best penalty kill. Heading into the 41st game of the season the Amerks continue to stay in first place in the North Division. Looking at the conference level the Amerks remain in the third spot. Syracuse and continues to stay on the heels of Rochester and with nine games between the two teams left to play this season there’ll be some gaps or changes ahead. Utica is only a point behind but they also have 5 games in hand. Last season at this time the North Division was already locked up. Two this time around. Zach Redmond tying the franchise record and Victor Olofsson scoring a beauty on one knee. Sean Malone – Unknown – day to day – treatment for a nagging injury. Andrew Oglevie – Concussion – indefinite – Occurred during the game on 11/30. Has started working out again.